Love smelling nice? Love Zara? Love a bargin? Well, I'll put my hands up and say I didn't quite ever imagine all those boxes would be ticked. Shock horror, they are now! Any impatient girls out there will know what it's like to get impatient waiting in queues, so I thought having a sniff of Zara's perfume offerings was only fair... right? And I can honestly tell you now, these perfumes smell incredible, and they're only a tenner each max. Ur bargin or what!? They really have got such a great variety. The Zara by Zara perfume in the blue bottle you see at the top of the picture is for those more classy, sophisticated girls out there. I'd opt for this one if I was going to a Business Meeting, Interview or maybe even Date Night. Zara Woman, Oriental is by far my favourite of Zara's perfume menu. It has the longest lasting power, gets the right balance between being sweet but not too sweet, floral but not too floral, sophisticated but not too over the top. Just perfect really, and it was only £8 or something. Crazy! So for any of you fellow perfume lovers out there who often splurge on a good bottle of perfume, be sure to give these a go as I'm sure you'll find one you love! 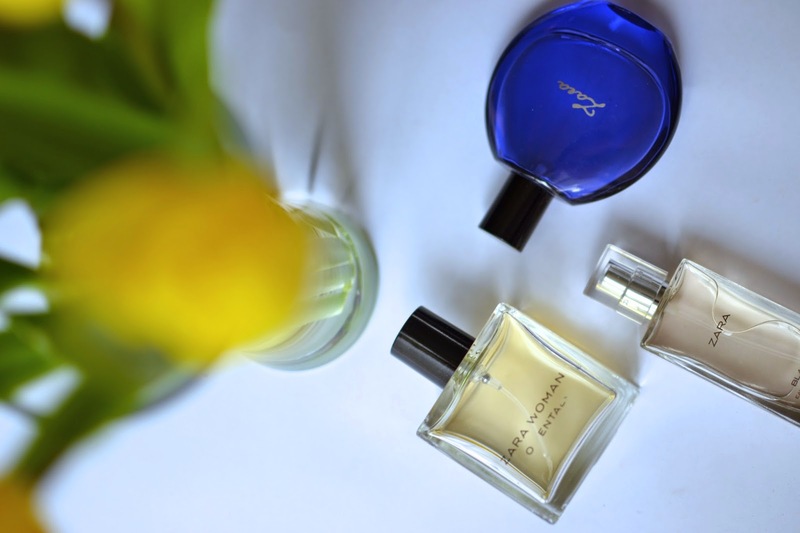 Have you tried any Zara perfumes before?